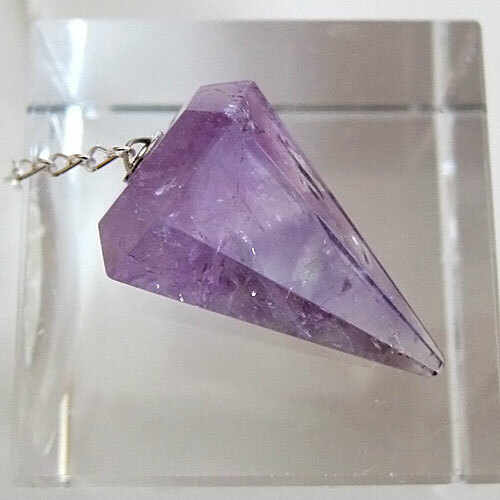 Dimensions (HxWxD): 1.5" x 0.875" x 0.25"
These beautiful Amethyst Light Filled Faceted Pendulums are incredibly luminous & come with their own silver chain wtih an average length of 6.5". This group of faceted Light Filled Amethyst Pendulums have great variety within each piece of amethyst with hues ranging from violet to lavender! They have beautiful inclusions including mirror, frost, ice and rainbow markings from the minerals within the stone as it was formed in Mother Earth! Each pendulum has great beauty and fits easily in the palm. It is the perfect weight, a tapered and elegant shape. This pendulum will bring spiritual clarity and light to any question you may ask. Check toward the bottom of this page to find access to free information on Dowsing with a pendulum from the American Society for Dowsers. We use amethyst as a stone of protection, especially to the auric field as well as for activating the third eye and accessing information from one's Higher Self. 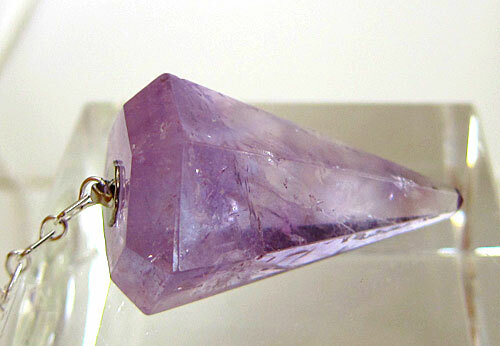 Use an amethyst crystal to channel in the violet ray of Cosmic Consciousness, associated with the crown chakra. Amethyst is also associated with the moon, feminine energy, creativity and intuition. It's very calming and also an excellent tool for communication with spirit guides. Small amethyst crystals are a great portable stone for energy workers and those who seek personal protection from negative energy. You can sleep with one of these pendulums under your pillow to stimulate meaningful dreams, to help you remember your dreams, and to protect yourself with a bubble of violet light all night long. Day and night, you can benefit from the unique energies of amethyst. All of our crystals have been cleaned with Universal Life Force Energy, and given an energy attunement using Reiki, a Japanese technique of energy healing, so it will continue to receive and transmit Universal Life Force Energy direct from the Source of Creation. It has also cleaned and charged with the natural energy of sunlight. It is ready for you to program according to your own needs and desires. Be careful with amethyst & direct sunlight. Prolonged exposure to the sun can fade the violet color of amethyst. Learn more about amethyst in the crystal section of the website. Check out the article "Using Quartz Crystals in Digital Technology, Healing and Meditation" for an overview of the metaphysical and mineralogical properties of quartz, and a step-by-step guide explaining how to cleanse, charge, and program quartz crystals for healing, meditation and other spiritual purposes. You can be sure that this pendulum will help you attain a clear mind and obtain a Divine Guidance in answer to any questions you may ask. As with all of our pendulums at Satya Center they come with a drawstring pouch in which to store it. You may find this link useful, it's one of the first 'how to' guides I used to learn how to use a pendulum. It covers working with dowsing, pendulums & more! Called "Letter to Robin", it is available online for free! Sponsored by the American Society of Dowsers. Note: the dimensions are average, each pendulum may vary somewhat in weight, color & dimensions. They are all of elegant proportions. 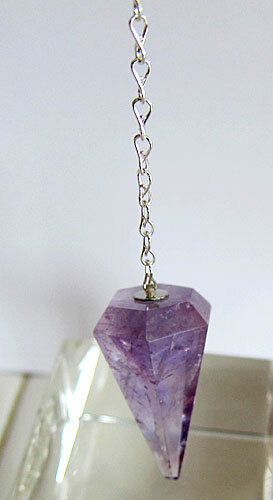 This batch of amethyst pendulums are ALL filled with light! Each pendulum is guaranteed to be beautiful & to meet with your complete satisfaction! Weight above is shipping weight. Average weight is 14 grams. Each piece is unique and may vary slightly in appearance and dimensions. Each piece is guaranteed to be beautiful and to meet with your complete satisfaction!